观点洞察 - Investing in the China of Tomorrow...Today. Investing in the China of Tomorrow...Today. Most investors agree that EM economy drivers are shifting from financials and energy to technology, consumption, healthcare, education and sustainable growth. Yet when we actually invest in EM, and onshore China, we simply focus on the largest listed stocks, i.e. yesterday’s drivers. One size does not fit all in China beta and today we dive into a new economy approach for A-shares that is a must for the long-term. As I sit in a plane (yet again), I can’t help but wonder how technology has changed our lives over the last few years. I have wi-fi at 38,000 feet, access to Netflix from my iPhone and of course can type this on a sub-1kg laptop with a touchscreen. Yet for much of the world’s population, new economy isn’t just a fancy app or wi-fi, but convenient access to consumer goods, better and more accessible healthcare and education, cleaner air and water, assistance for the elderly. From an investment point of view, these trends are among the biggest drivers of emerging market economies today. Why don’t we invest this way? There’s a clear difference here – though we frequently focus on China’s new economy and the country’s R&D, we all lack efficient tools to access this market. FTSE A50, the most popular A-shares benchmark is ~60% financials. Of its top 10 stocks, 8 are financials. CSI 300 and MSCI China A are only slightly better at 6 of 10. Now, you may be wondering how I’m going to spin this into a smart beta story. After all, we are launching the world’s first multi-factor A-shares ETFs* in a few days. The reality is that as wonderful as factor investing is, it simply doesn’t matter if you have the wrong asset allocation. That is why we believe that one smart beta A-shares ETF isn’t enough – investors need a mainstream and a new economy version to actively allocate between the two. What does New Economy look like? Late last week I wrote about our Bedrock ETF (2803 HK). This week’s post is about the new economy version (3173 HK) and why it’s an investment you may think about for the long-term. First, let me show you the result, and then we’ll dive into construction and other comparisons. On a sector basis, traditional benchmarks focus on financials, real estate and other old economy sectors. That may be where current revenue and market cap are, but it’s also where over-capacity and non-performing loans reside. Growth, on the other hand, is concentrated in emerging sectors such as consumer discretionary, technology, healthcare and the like. On an individual names basis, the picture couldn’t be clearer. Our new economy strategy has 1 financial name which isn’t a bank or an insurer but is instead focused on wealth management. It benefits from the megatrends of rising middle class and financial market liberalization in China. 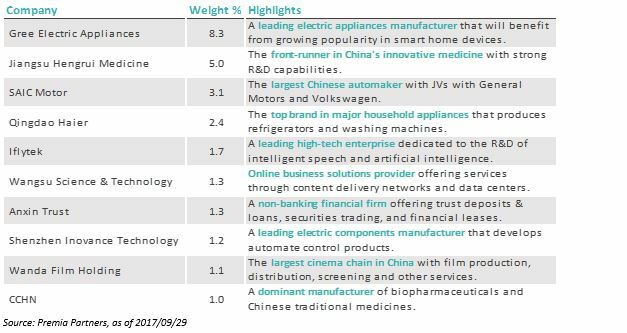 The number 1 position is Gree Electric – the largest air conditioning manufacturer in the world and one of China’s biggest investors in home automation. The emphasis here is on what China is prioritizing going forward, not what it used to get to today. How do we build the New Economy exposure? Similar to Bedrock, we’ve partnered with Dr. Jason Hsu and his team at Rayliant Global Advisors, to design a multi-factor strategy that works for China and a isn’t a blind copy and paste from the US. We use a 3-step process to build a new economy universe that captures the China of tomorrow better than a market-cap index ever could. How does New Economy compare to other options? From a sector and top exposures point of view, the answer is clear. Minimal financials, real estate, utilities, consumer staples and more emphasis on consumer discretionary, technology and healthcare sectors. 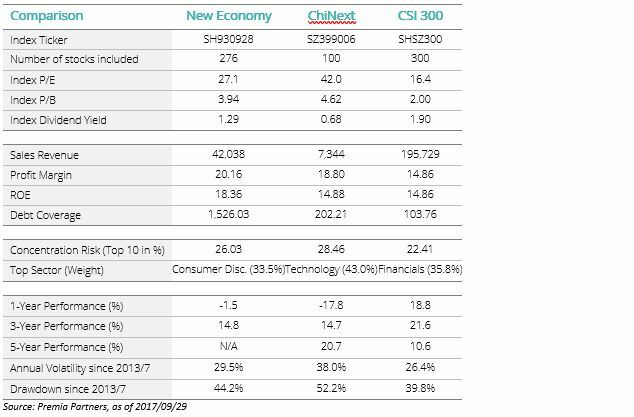 Below is a table comparing New Economy to ChiNext and CSI 300. Most people think of Chinext when the topic of China new economy comes up. But ChiNext is primarily technology small caps only. The hundreds of millions newly middle class Chinese citizens are looking for more than an iPhone alternative. They want cars instead of bicycles, air conditioning instead of fans, leisure travel, better healthcare, cleaner air, higher quality goods, etc. Many of those things can only be developed by larger firms with available capacity. That’s why we constrained our New Economy universe by sector, not by market cap, and then focused on emphasizing the factors that we believe matter most. The firms in our New Economy universe have higher revenues and margins, much lower debt and better valuations than ChiNext. As a result, the portfolio is much less volatile and performs better than ChiNext and CSI 300 in our backtests. What are the implications of New Economy for long term value creation? It is sometimes said that PE and VC investing are akin to leveraged small cap strategies. In China, such strategies typically focus on new economy companies as they deliver high growth and long term value creation to compensate for old economy sectors that are slowing amid structural transformation of the overall economy. Even that BATJs (Baidu, Alibaba, Tencent, JD.com) have reconfigured their businesses for long term value creation by inorganically adding capabilities in the new economy space – almost half of China’s 46 unicorns are backed by one of them. China’s most successful technology companies and the world’s most successful PE and VC investors are all focusing on the megatrends that New Economy provides exposure to – urbanization, rising middle class, consumer upgrade, aging population, education and healthcare. The challenge, however, is that investors struggle to deploy their desired level of capital given the illiquidity, access and capacity issues in this space. That’s where the Premia CSI Caixin China New Economy ETF (3173 HK) comes in. It is a transparent and convenient way to access this part of the market, while also capturing the potential excess return delivered by quality, non-fixed asset, growth and liquidity factors.